What starts as a small lump can lead to big trouble. October is Breast Cancer Awareness Month, and women 40 or older are advised to have their annual mammogram. Summerlin Hospital Medical Center, 657 N. Town Center Drive, and The Valley Health System are offering $50 mammograms all month. Summerlin Hospital opened The Breast Care Center, which occupies 1,800 square feet, Oct. 1. The hospital has invested $750,000 in the new unit, including machines and build-out. It features the latest diagnostic imaging machines, including digital mammography and stereotactic biopsy capability. "The digital equipment is so accurate, it can detect even small lesions," said Robert Freymuller, Summerlin Hospital CEO and managing director, adding that the new unit offers everything from testing to information. "We wanted a place where it was all done at once, all in one center," he said. Each year more than 1,000 women undergo mammograms, breast biopsies and breast surgery at the hospital. Digital mammograms are achieved through Hologic’s LORAD Selenia system. While breast compression is still part of the procedure, the discomfort is lessened with cushioning. According to the National Institutes of Health, as many as 30 percent of analogue mammograms done nationally necessitate re-testing due to inconclusive results. "As we live, we learn," said Dr. Souzan El-Eid, who heads the unit. "When we didn’t have digital, we didn’t know any better." The machine determines whether a lesion fits into one of five categories, the highest category being "highly suspicious." Those with suspicious lesions then step into the next procedure room for a biopsy. In the past, biopsies had to be scheduled, included sedation and left a scar as long as 3 inches. Stereotactic biopsies are done at The Breast Care Center with only a localized injection to numb the area and a needle inserted to extract cells from the suspect area. It not only is less invasive, but it does away with the prolonged wait period that the old method heaped on women, a stress inducer for many patients. 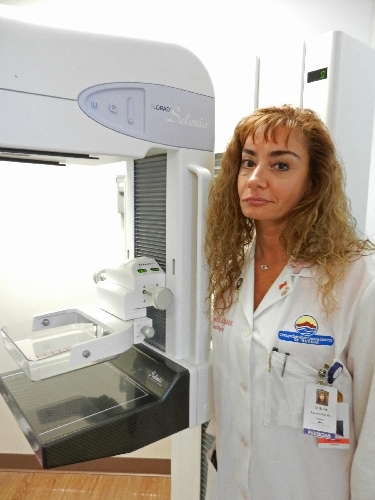 "Once a woman is told her mammogram is suspicious, she wants the biopsy done yesterday," El-Eid said. The Bard Encore is the latest generation of biopsy machines. The patient lies face down on the table, which has a circular hole in it. A local anesthetic is administered — a stick and a sting. Once the patient is numb, the table platform can be raised, similar to an elevator. The doctor sits underneath it with the mammogram unit to the side. By not seeing the procedure, the patient is less aware when the needle goes in and the biopsy is taken. Once that’s done, the platform is lowered and the patient climbs off. It takes mere minutes. The Breast Care Center also houses a Hologic Discovery Densa scanner, which addresses bone density. It can complete the scan in two minutes. Older units took 10 to 15. Breast cancer patient Janet Brown has been diagnosed with cancer not once but three times. She found a lump in 2002 and learned she had stage 2 breast cancer. Then it was found to have metastasized to her liver in 2008 and to her neck this year. While her first mammogram and ultrasound were done on the same day and in the same facility, she recalled having to wait two weeks to get into a separate place to have her biopsy done. "Those two weeks were incredibly stressful," she said. "At least with knowing (having a diagnosis), you can have a plan of action." Brown said having everything in one place, such as at The Breast Care Center, "would prevent a lot of stress and worry, especially when time is so imperative. Having them done all in one place, that’s an incredible improvement." Summerlin Hospital said the center will be involved in clinical studies almost immediately. Susan G. Komen for the Cure and the American Cancer Society also may play a part. Screening results from the $50 mammograms will be mailed to the patient’s physician. The special price must be paid in full at the time of service and cannot be used in conjunction with any insurance, Medicare or Medicaid. To schedule a screening, call 233-7203. For more information about The Breast Care Center, visit summerlinhospital.com. The Breast Care Center at Summerlin Hospital Medical Center, 657 N. Town Center Drive, is offering $50 mammograms throughout October in honor of Breast Cancer Awareness Month. For more information or to schedule a screening, call 233-7203.